One hotel suite, two wives, three girlfriends, four tenors, and a soccer stadium filled with screaming fans. What could possibly go wrong? It’s 1930’s Paris and just hours away from "The Concert of the Century!" But love affairs, bedroom hijinks, mistaken identities, and opening-night chaos have producer Henry Saunders desperate to try just about anything for the show to go on. 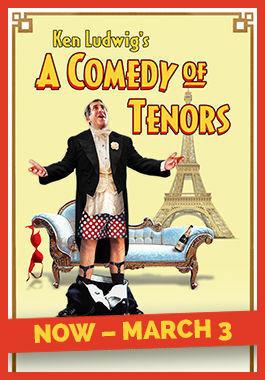 From comic genius Ken Ludwig, and starring Walnut favorite Frank Ferrante, get ready for A Comedy of Tenors, an uproarious comedy filled with slamming doors, unbridled passion, and madcap hilarity on an operatic scale!